93M is the Hungarian version of ARFA, developed by GIAT Industries and adopted by the French armed forces. The mask is equipped with a 40xl/7" connection thread to the filter, a voice transmitter and a drinking device. The body of the mask and the visor assembled with it is made of polyurethane, resistant to the aggressive agents and meeting the chemical protection and combat requirements. Available in four sizes the mask provides a very good airtight seal for different face shapes and insures good comfort for at least 24 hours, without causing stress. 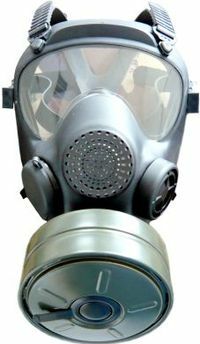 NBC filter developed by Respirator Company., which provides protection against gases, vapours, dusts and aerosols, chemical warfare gases. Equipped with straps, allowing adjustments and fixing either on the shoulder or the waist belt, the carrying bag made of water repellent material provides room for the mask and its accessories. Thread of the mouth: rd 40x1/7"